The sixty (60) day eviction notice, or ‘notice to quit’, is a form that is given to a tenant from a landlord most commonly when they have decided to terminate a month to month tenancy. This type of arrangement (usually known as a ‘tenancy at will’) is a mutual agreement between the landlord and tenant for the renting of property without an end date. The lease ends upon the time period stated in the rental agreement or by checking the State statutes. Once the notice has been given, to either the landlord or tenant, the time period begins and upon the end the tenant must move-out or face an eviction suit. California – For a month to month tenancy that has been in existence for more than one (1) year. Delaware – In accordance with Title 25 § 5106 for all tenancies at will. Both landlord and tenant must use for termination. The buttons presented in the preview image’s caption area will each lead to a different file version of the same document. 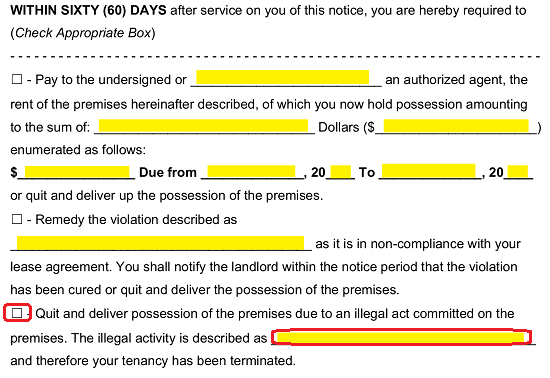 You may use this document to serve a Tenant with 60 Days of Notice that he or she must correct a violation or vacate the premises. Decide upon the file version most compatible with your system then use your left mouse button to select the appropriately labeled button. Once you have opened this file and confirmed it is the template you require, download it to your machine. Open it and supply the information it requests upon your discretion. Conclude the Identification Of this Lease by recording the name of the State that governs this agreement. Typically, this is where the Premises is located. Now that we have properly defined the Recipients, the Premises involved, and the Lease that has been violated by the Tenants (and Subtenants), it will be time to provide the official Notice that your State will require delivered. Three checkboxes have been presented beneath the bold words “Within (60) Days.” Each one will address a specific scenario and correspond to a checkbox. Read each one thoroughly then mark the box that best applies. 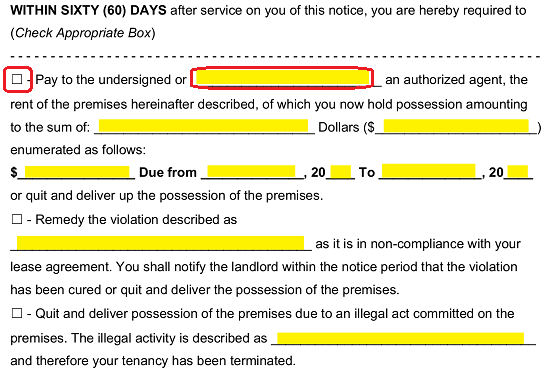 If the Tenant(s) have neglected to pay the rent required by the lease in a timely manner and will now be required to do so or surrender the Premises to the Landlord (in Sixty Days) then, mark the first checkbox. 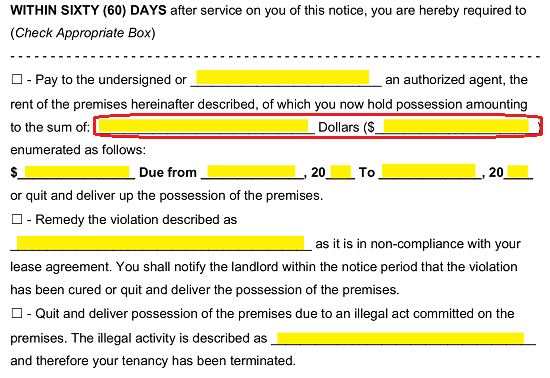 If the Signature Landlord is not the party who the Tenants must submit this payment to, then enter the Name of the entity that will accept the overdue rent on behalf of the Landlord on the first blank space after the phrase “Pay To The Undersigned Or…” When choosing to apply the first statement, the Total Amount of Money (including any penalties) the Tenant must pay to rectify the situation should be written out using the space available after the words “…The Sum Of.” You will also need to supply this Amount numerically on the blank line in the parentheses. 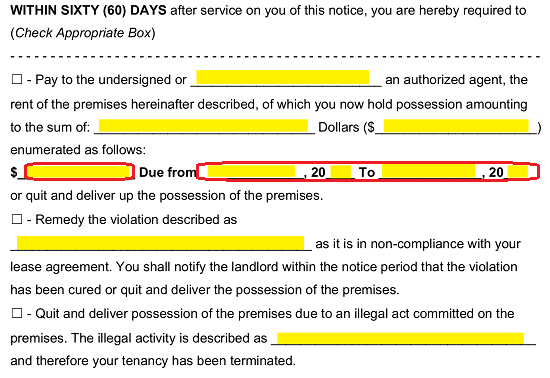 Finally, record the Overdue Rent Amount on the blank space just before the phrase “Due From” then, record the Months and Years that define the time frame when this amount should have been paid to the Landlord to remain in compliance with the lease. 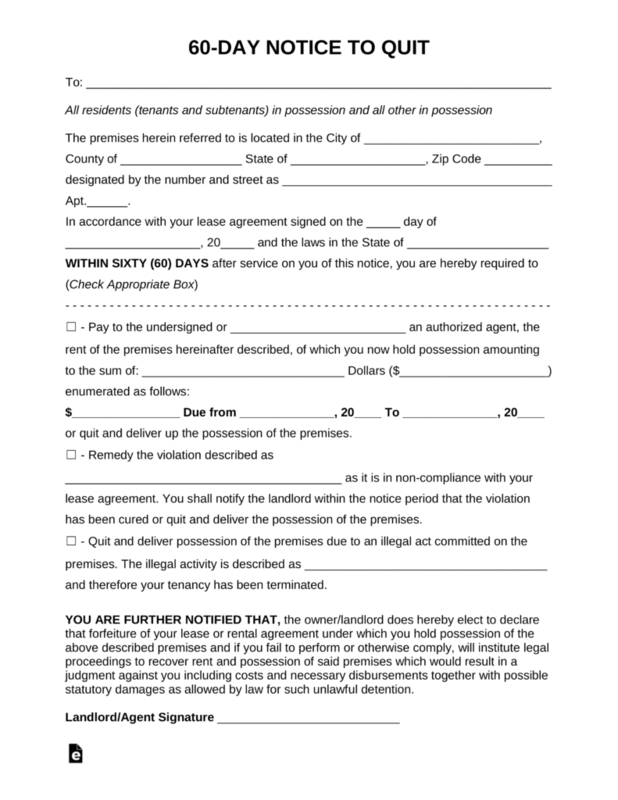 The Landlord or Property Manager must sign this form once it has been supplied with the necessary information. He or she should sign the blank line labeled “Landlord/Agent Signature” at the bottom of the first page. The second page, titled “Certificate Of Service,” will have to accompany this document when it is presented to the Delivery Agent. 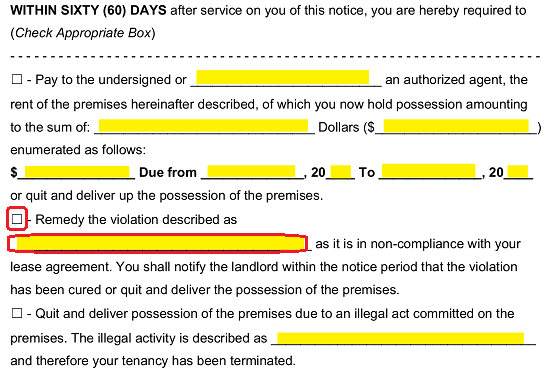 This will require some information that may only be supplied by the individual/service delivering this Notice to the Tenant after the point of delivery. First, he or she must use the testimonial statement to report the Two-Digit Calendar Day, Month Name, and Two-Digit Calendar Year when he or she served this Notice to the Recipient Tenant. The first three blank spaces on this page have been supplied to accept this information. The fourth blank space will require the Name of the individual(s) who physically took possession of this document upon delivery. Three checkbox statements have been supplied below this initial testimonial. One of these must be check marked by the delivery agent to indicate how this Notice was Delivered to the Recipient. If it has been delivered personally to the Tenant(s) residing on the Premises, mark the first checkbox. If it has been delivered to an appropriate third party who will give it to the intended Recipient, then mark the second box. If neither of these statements are applicable and the Delivery Agent has mailed it using First-Class Mail, then mark the third checkbox. Only one of these checkbox statements may be selected. 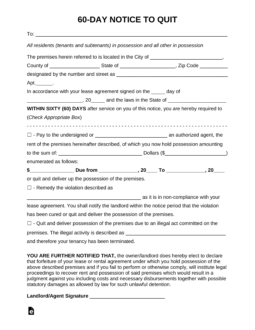 The Delivery Agent must sign his or her Name on the “Signature” line as proof that he or she has delivered the Notice according to the report on this page.